If a user has an appropriate role associated with their account, they are granted access to the Visual Analytics Query builder in the main hub screen (as shown by the ‘Create Data Query’ option. When a query is created using the Visual Analytics Query Builder, the resulting output dataset is created in the LASR server by default, as can be seen in the ‘Location’ field in the right-most pane within the Query Builder. 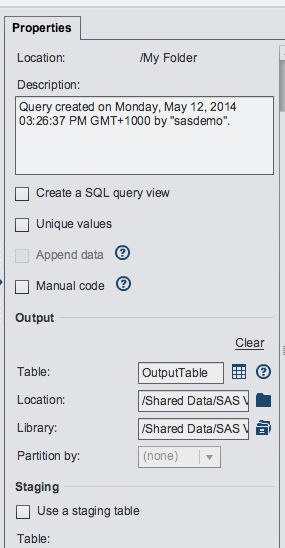 When the query has finished running, the resulting dataset is registered and loaded automatically into the LASR server. The output dataset shall only stay loaded until the server is restarted. If a user is expecting a query output table to be loaded into the LASR server upon a LASR server restart, the user must manually re-run the query or schedule the query to be run shortly after the server restarts. For more information on scheduling queries, please refer to the article 'How To: Scheduling Queries'.